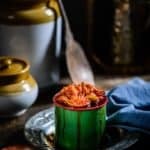 Avakaya is a spicy mango pickle from Andhra Pradesh and is my most fav pickle recipe. 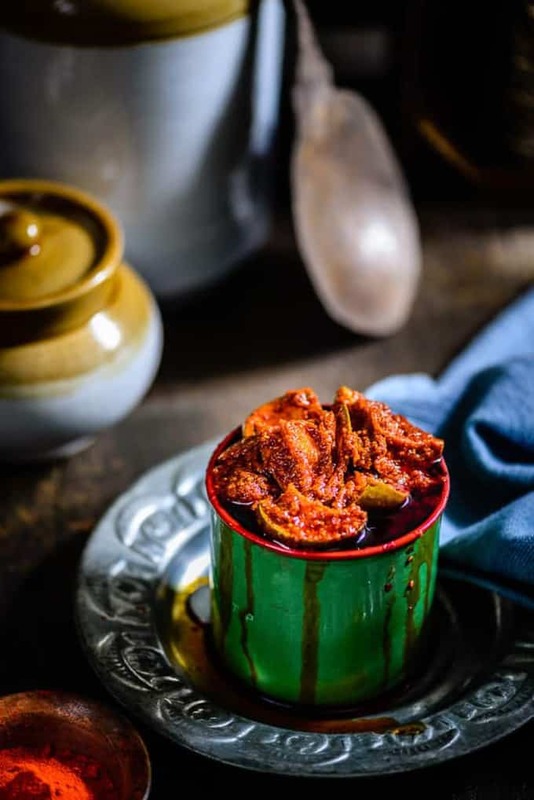 Made using sour raw mangoes and spices, this homemade Andhra Mango Pickle recipe is a keeper. Here is how to make Avakaya Recipe. India is certainly a nation of pickles. With so many states, we have a pickle that represents every state of our country, indeed! Avakaya or Avakai is a popular pickle that is prepared by the Andhra people in the southern part of India. It is made by using raw mangoes and spices like any other pickle but instead of mustard oil which is used in North Indian pickles, sesame oil is used. The name ‘Avakaya’ is a combination of ‘ava’ which means mustard and ‘kaya’ which means mango. For preparing Avakaya Pickle, Andhra people prefer using a variety of mangoes which are mostly uniform in size. Also, they are particular about using fully raw and sour mangoes that are hand plucked from the tree for making Avakaya. 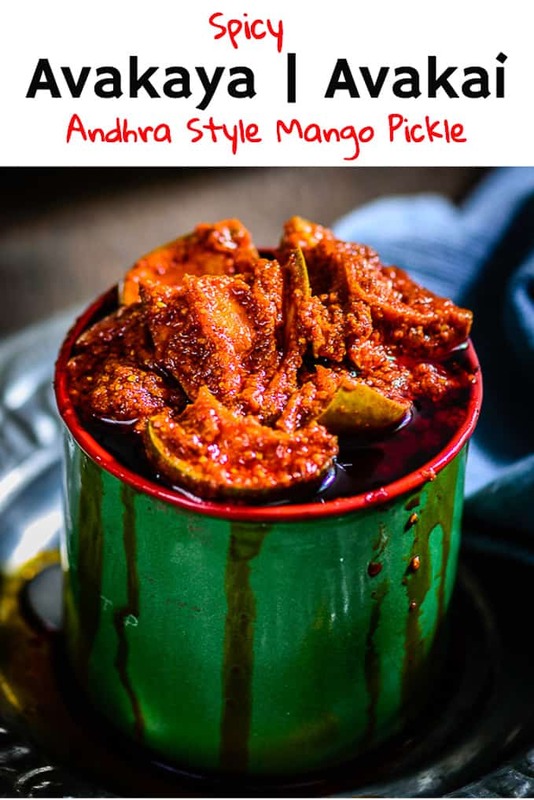 Keeping the same in mind, I thought of preparing this Andhra Style Mango Pickle at home. As my parents had sent us some of the choicest raw and ripe mangoes bought from a family friend’s orchard, making Avakai Pachadi got really easy. 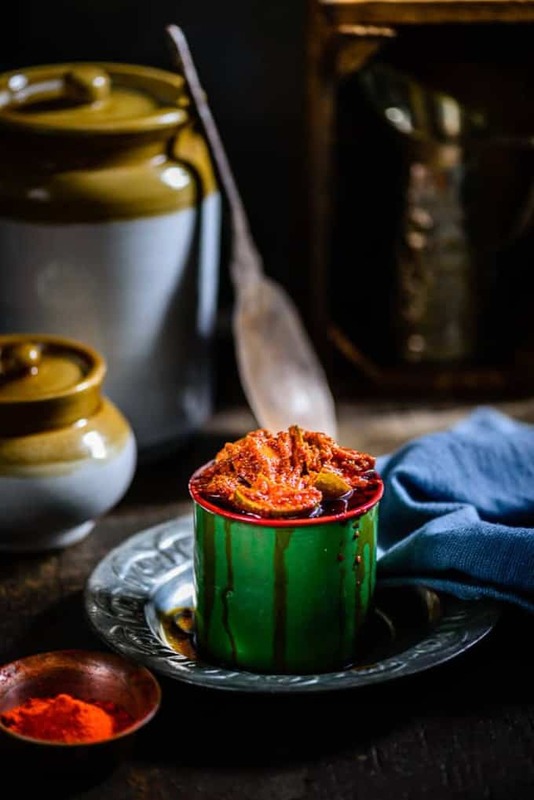 As Andhraites love eating spicy food, Avakaya is spicy as well and as garlic pods are generously added in this Mango Pickle, this accompaniment is bound to be seasoned and sharp! Moreover, Avakaya even has a strong flavour of mustard and fenugreek. Made in almost every Andhraite’s household, a meal for them seems incomplete without the serving of Avakaya. You cal also add lots of whole garlic cloves to this pickle and make Allam Avakaya. This spicy accompaniment is relished with yogurt and steamed rice. Having eaten the same at one of my friend’s place who happens to be from Andhra Pradesh, I can say that when it comes to pickle, this Avakai scores ten on ten! 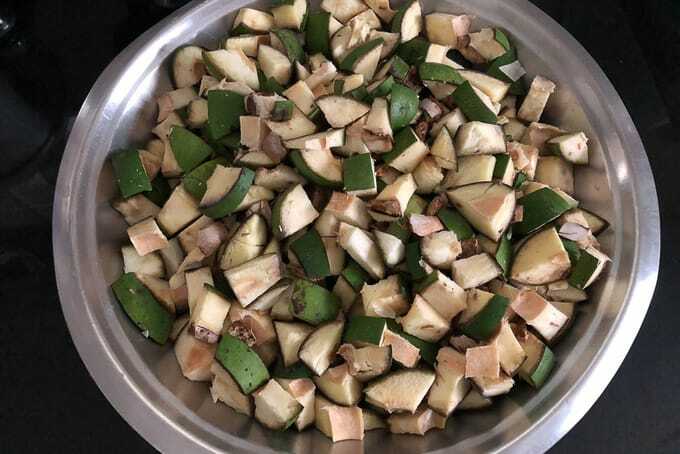 Make sure that you relish Avakaya without fail this summer, read my easy recipe for the same and prepare a jarful of Avakaya soon! Use sour raw mangoes. They are the best when the season just starts for Mangoes that is in May June. Cut them into even pieces. You can also get them cut from the vendors who have cutting machines. They sit all over the local vegetable market in India. Make sure to cover the pickle with oil at all times. It will ensure it doesn’t go bad. 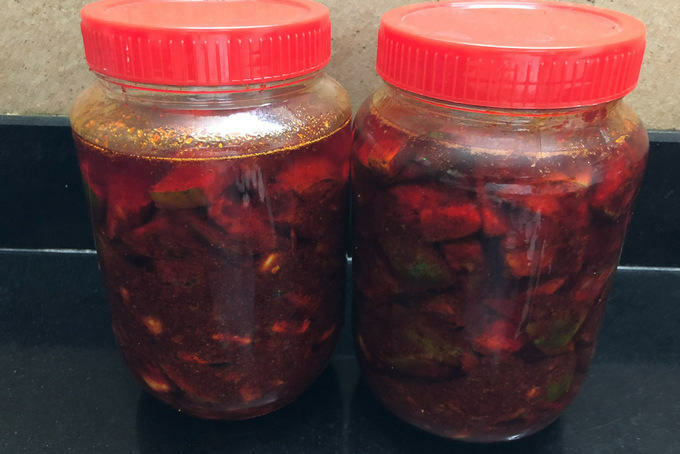 This Andhra style pickle uses Sesame Oil. Replacing it with any other oil will not give the same flavour. Always use a clean dry glass jar to store the pickle. A plastic one will leave a smell in the pickle which will be very non appetising. How to make Tomato Avakaya? You can replace raw mangoes with tomatoes and make Tomato Avakaya. Cut tomatoes in small pieces and mix with some salt. Spread them on a plate and sun dry until they loose all the water. Now use these tomatoes in place of mangoes. Spread the mango pieces on a clean kitchen towel and let them dry for 3-4 hours. 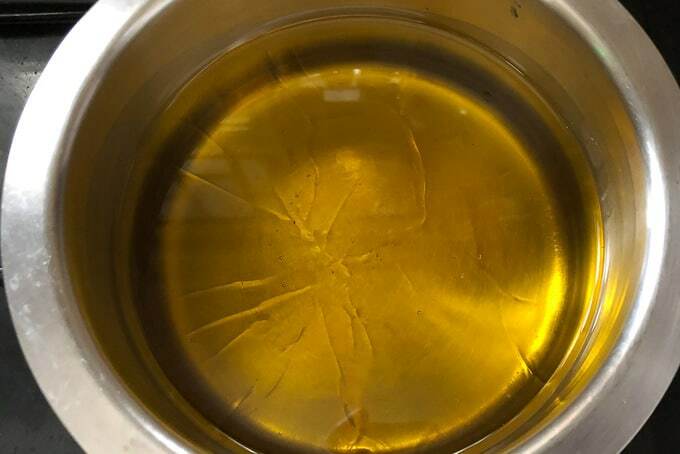 Heat oil in a pan until it is very hot. Remove the pan from heat and let the oil cool completely. 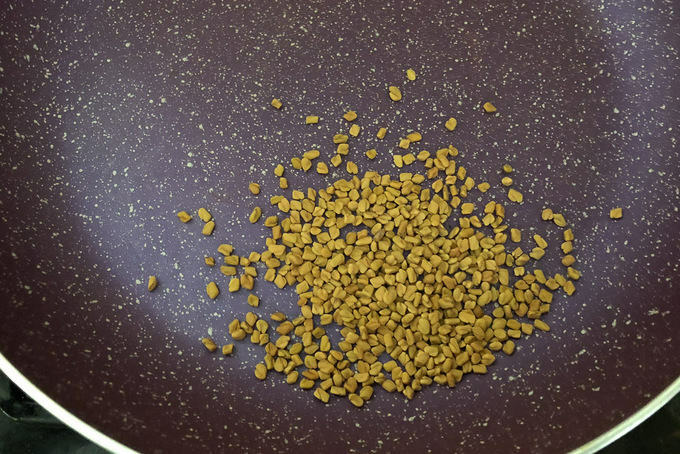 Dry roast fenugreek seeds until slightly browned. 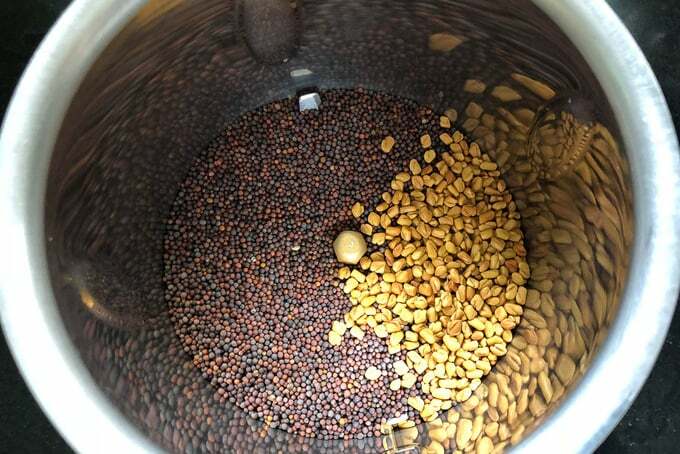 Add fenugreek seeds and mustard seeds in a blender and blend to make a smooth powder. 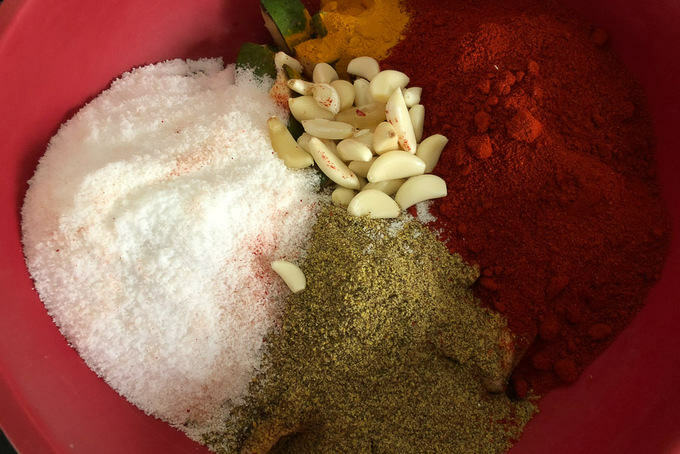 Add mango, fenugreek and mustard powder, red chilli powder, turmeric powder, salt and garlic pods in a bowl. Now add half of the cooled oil and mix well. Transfer the pickle in a clean glass jar. Top with the remaining oil. Cover the jar with a lid or tie with a muslin cloth. Keep the jar in strong sun for 3-4 days. 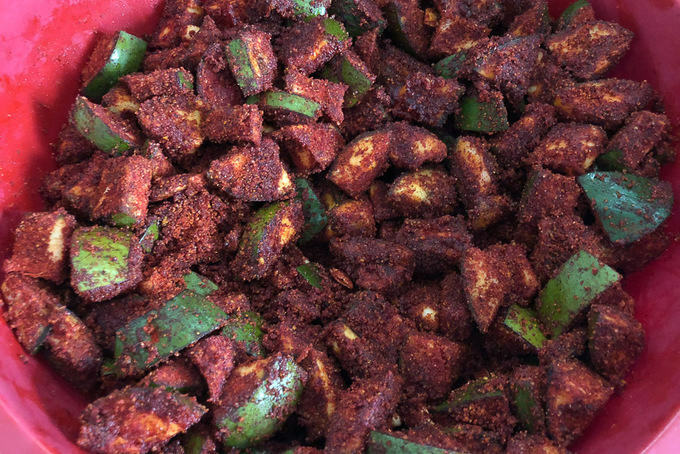 Avakaya is a popular pickle that is prepared by the Andhra people in the southern part of India. It is made by using raw mangoes. Heat oil in a pan until it is very hot. Remove the pan from heat and let the oil cool completely. Transfer the pickle in a clean glass jar. Top with the remaining oil. Cover the jar with a lid or tie with a muslin cloth. Keep the jar in strong sun for 3-4 days. The pickle is ready to use now. Top the jar with more oil to make sure mangoes are covered with oil.